It is winter and on those extra cold days there is nothing better than a big bowl of homemade soup. I love to have a big pot simmering on the stove or in your crockpot on those especially on those extra cold days. I don’t know what it is, the smell that lingers threw the house or if it is just the fact that soup is the perfect thing to warm you up but it is pure comfort food for me. One of my favorites is Potato Soup. When I worked at a Darryl’s in Orlando, Florida a few years back it was my staple lunch or dinner when I was working. After moving away I was always looking for a recipe that came close and I finally found one a couple years ago and have tweaked it a bit over the years. The recipe is a simple easy recipe for your crockpot. I have shared it with friends and they agree that this soup is the best. 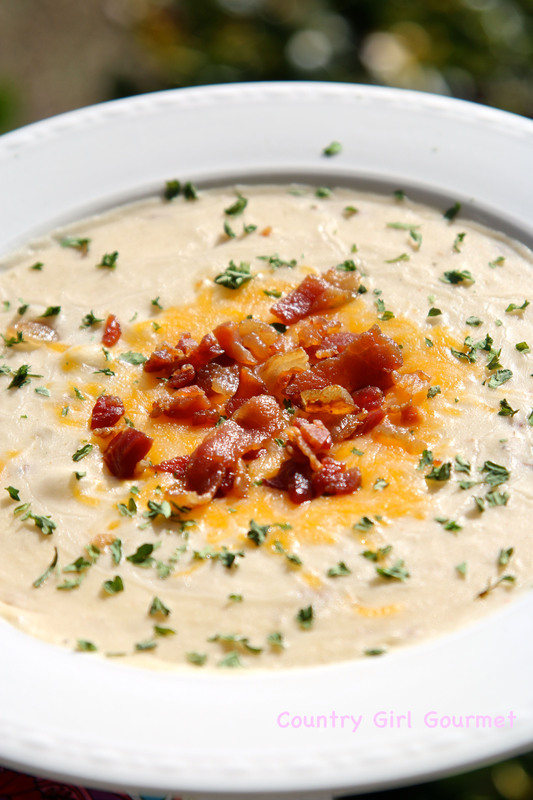 If you are a Potato Soup lover this is a must try! additional toppings- cheese, bacon, parsley, etc. Add potatoes, onion, garlic, bacon,season salt, pepper and chicken stock to crockpot. If needed add water to make sure potatoes are covered. Cook on high 6-8 hours. Some crockpot's cook hotter than others. You want the potatoes to become fork tender. Once potatoes are done place ½-3/4 of potatoes in a bowl and mash with the cream cheese. After the potatoes are mashed return them to the crockpot and stir until well combined. Cook for an additional 30 minutes. Serve and garnish with your favorite toppings.